A law banning Islamic headscarves and other religious symbols from French state schools came into effect on Thursday, the first day of term. So far, most pupils have been observing the law by removing the headscarf or other symbols before entering school. 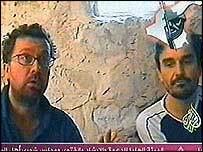 The lives of two French reporters, held by Iraqi militants who want the ban scrapped, still hang in the balance. The French government has refused to give in to the militants, who have threatened to kill the two. But Paris is continuing a diplomatic effort to secure their release. French education authorities with a large Arab population were on high alert on Thursday. Teams of mediators were on hand to intervene in any dispute. Schools have been told not to automatically exclude pupils who arrive wearing headscarves, but to try and avert a showdown through dialogue. The law, which affects 12 million children, calls for a period of dialogue, although Education Minister Francois Fillon has stressed that there is no room for negotiations. "There is no question today of excluding. It is a question of convincing," he said. As classes opened, one Muslim girl in the working-class Paris suburb of Aubervilliers said she had left her headscarf at home. "I was always treated badly and I felt uncomfortable, so I decided to take it off," Nadia Arabi, 16, told the Associated Press before heading through the gates of Henri Wallon school. The ban is not only affecting Muslims. Sikhs argue that their turbans are not religious symbols. Young Sikh Ranjit, 15, went to the Jean-Rostand school in the Parisian suburb of Villepinte on Thursday morning to get his new timetable, wearing a thin strip of material on his hair rather than his customary turban, AFP news agency reports. The ban is designed to maintain France's tradition of strictly separating state and religion. 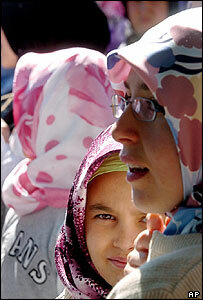 It forbids state school students from wearing "conspicuous" religious apparel. Jewish skullcaps, Sikh turbans and large Christian crosses are also banned. The BBC's Caroline Wyatt in Paris says the hostage-takers' demands have had one unintended consequence - to unite France against them, making it much harder for radical Muslims to protest against the ban. Nobody in France wants to be seen siding with the kidnappers, our correspondent says. "The hostage crisis has had a sobering effect on the row over the headscarf"